The CE4 is a current-excitation module that applies a constant current to the heating element of up to four 229 Heat Dissipation Water Matric Potential Sensors. A current-excitation module is required when you use 229 sensors to measure soil water matric potential. 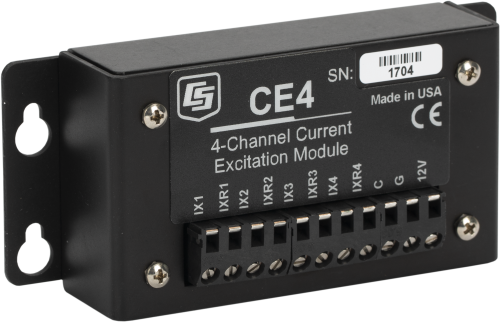 A CE4 current excitation module can provide a constant current to the heating element of the 229. The CE4 sources current for up to four 229s. The module requires a 12 Vdc power source. The number of 229 sensors measured by one data logger can be increased by connecting a CE4 to one or more AM16/32-series multiplexers. Up to four multiplexers can be connected to the CE4. The CABLE3CBL can be used to connect the CE4 to the data logger (see Ordering Info). The CE4 requires 12 Vdc power. A data logger control port is typically used to activate the module. When the control signal is received, all 4 channels output a 50 mA source current to the connected loads (typically 229 probes). When the control signal is dropped to 0 Vdc, output from the module ceases. 25 mA + (50 mA)(the number of 229 sensors connected to the CE4 outputs). The CE4 can source current for four probes directly. In applications that require more sensors, the output(s) of the CE4 can be connected to as many as four AM16/32B multiplexers, greatly expanding system capacity. When using multiplexers, the user should be aware that switching currents of greater than 30 mA will degrade the contact surfaces of the mechanical relays. This will adversely affect the suitability of these relays to multiplex low voltage signals. Although a relay used in this manner no longer qualifies for low voltage measurements, it continues to be useful for switching currents in excess of 30 mA. Therefore the user is advised to record which multiplexer channels are used to multiplex the 50 mA excitation for the 229-L probes in order to avoid using those channels for low voltage measurements in future applications. The CE4 requires a desiccated, non-condensing environment; a Campbell Scientific enclosure is recommended. The CE4's case has mounting flanges for attachment to the 1"-on-center hole grid of Campbell Scientific enclosures. Grommets and screws are provided to attach the flanges to the backplate of our enclosures. Can the CE4 and CE8 be used to make measurements of a non-bridged PRT? No. Typically a PRT will experience self-heating if more than 1 mA of current excitation is applied, while the CE4 or CE8 output is 50 mA. What principle does the control line of the CE4 and CE8 work with? Is it a digital signal or an analog voltage? The CE4 and CE8 have CMOS circuitry controlled by a 0 to 5 Vdc analog signal provided by a data logger control port. What is the expected current drain for the 12 Vdc supply for a CE4 or CE8 module when CTRL is high? Current drain = 25 mA + (50 mA) x (3 sensors) = 25 mA + 150 mA = 175 mA. The current drain for a CE4 ranges from 75 mA to 225 mA. The current drain for a CE8 ranges from 75 mA to 425 mA. Can a CE4 or CE8 be used as a current source, measuring the voltage drop across a resistor to calculate resistance? What is the purpose of the CE4 and CE8? The CE4 and CE8 are constant current devices designed to produce a constant current to the 229-L Water Matric Potential Sensor. See the 229-L product page for more information. Is there a specific type of wire that should be used to connect the 12 V and ground terminals on the CE4 or CE8 and the data logger? Campbell Scientific recommends using the CABLE3CBL-L, a 22 AWG cable with three conductors and a drain wire. However, any type of copper wire between 18 AWG and 22 AWG could be used to control the CE4/CE8. What is the output voltage and intensity of the CE4 and CE8 modules? Vout = 0.05 A/RL where Vout is produced in volts and RL is the resistance of the load in ohms.